In a study published in JAMA Psychiatry it was found that an important brain area involved in emotion— the right anterior insula— is smaller in school-aged children diagnosed with depression as preschool-aged children, and can predict risk of future struggles with depression. 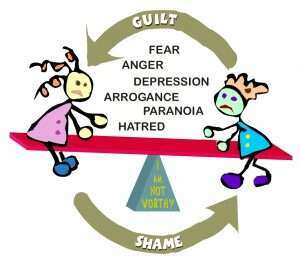 Innocently, we define shame and guilt through our experiences, the opinions of others, and our culture. Our behavioral choices concerning them stem from our definitions. The majority of cultures identify unworthiness and wrongdoings with the words shame and guilt. We perceive guilt as I did something bad and the need to repent. In contrast, we perceive the word shame as I am bad. Throughout the ages, we have amassed many definitions for the origin and meaning of shame and guilt, which abound with biblical, mythological, and spiritual overtones. Eastern and Western cultures, as well as their subcultures, proclaim opposing definitions. They can be considered good, bad, healthy, or toxic. No surprise that we reinforce its cycle of abuse. This residue produces a cumulative effect which amplifies our negative destructive emotions.This accumulation escalates benign hurtful feelings into overwhelming fear. It accumulates within us and supplies the energy force needed to intensify an unexpected negative reaction to a simple remark. A small quantity of repression will most likely keep us in a low intensity of hurtful feelings whereas a large accumulation escalates benign hurtful feelings into an explosive confrontation. The intensity of a negative reaction depends on the quantity of our repression; the greater the repression, the more energy available to intensify our negative state. You will realize the quick and exciting changes that happen with recognizing and releasing shame and guilt from your life.